This much-loved tale from America is a heart-warming treat. Eunice ‘Pixie’ Day was a goat herdswoman who lived on her own homestead farm in Maine, breeding and looking after her champion Saanen goats. 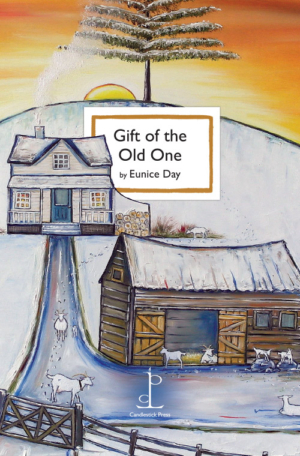 Her story of an elderly couple and their cherished herd is told in language of spare and simple beauty that will delight old and young alike. This briefest of tales encompasses enduring themes of youth and age, constancy and love, as well as the many rewards of devoting one’s life to the care of animals and the land. Eunice Day’s plain-spoken narrative has established a remarkable legacy, even after her death. No surprise, then, that it has become traditional to share Gift of the Old One with a fellow animal-lover as a very special Christmas greeting. Other new Christmas titles from Candlestick this year are Christmas Garland, Christmas Crackers, Christmas Stocking and Fourteen Festive Sonnets. We are also publishing another seasonal short story: Holly and Ivy. Also includes poems by James Stephens and RS Thomas. Poems exploring how nature embellishes our idea of Christmas. Ten brand new Christmas poems with an extra dash of zing. A sumptuous selection of sonnets old and new. Five festive poems for children.